Easy cheesy chipotle chicken is a crowd pleasing meal for a family that enjoys a little spice at dinner time. The heat from the chipotle peppers are balanced by the rich cream cheese to create a simple yet balanced cream sauce. Depending on the dinner you are preparing, you can shred the chicken and turn them into creamy chicken tacos or serve the breasts whole with rice and roasted vegetables. Step 2: Season the chicken breasts with salt and pepper on both side. 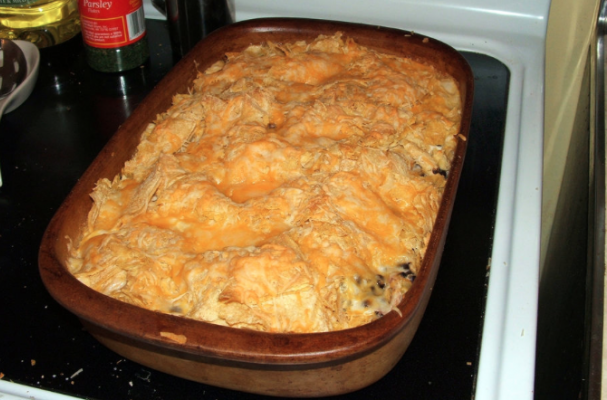 Place the chicken in a casserole dish. Step 3: In a food processor or blender, add the cream of chicken soup, the cream cheese, 1 or 2 chipotle chiles (you can remove the seeds if needed), a tablespoon of adobo sauce and cilantro. Blend the mixture until smooth. Pour the sauce over the chicken until fully covered. Step 4: Bake the chicken for 25 to 30 minutes or until cooked through. *Note: This recipe can also be prepared in the slow cooker.